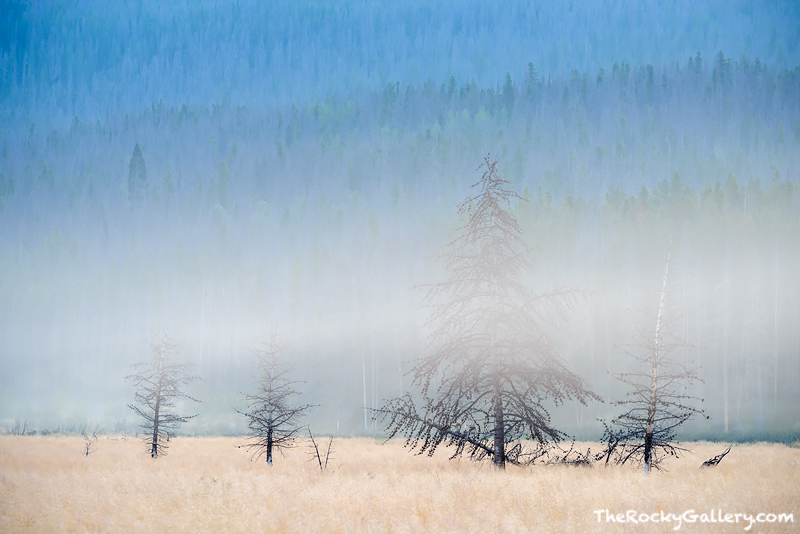 It's a cool start to a late summer morning in the Kawuneeche Valley of Rocky Mountain National Park. As is often the case in the Kawuneeche, low lying fog developed overnight in the valley setting a mystical and moody tone in the valley. Over the last ten or more years, the pine beetle has taken it's fair share of pine trees on the west side of Rocky Mountain National Park. This morning the fog moves through the casulties of the pine beetle but the skeletons of these pine trees in the meadow still inspire beauty. Photo © copyright by Thomas Mangan.